My inaugaral font of the month is the work of Julieta Ulanovsky, who lives in Buenos Aries. She drew the inspiration for the font from the urban, hand-drawn lettering on old posters, signs and other letterforms in the neighbourhood where she lives and works, Montserrat. The typeface evokes the modernist style of the early 20th century, but it feels less formal than, say, Futura. Montserrat comes in 3 variants right now, the original regular version, an alternate caps version and "Subrayada", which has built in underlining (and which I am not so keen on). The alternate caps are probably more suitable for display being a little wacky, Julia says that they are intended "to capture the variety and soul of Buenos Aires". Interestingly, Julia’s work was funded by folk on kickstarter, which seems to be everyone’s patron these days. Here is the campaign video. For me, the most useful varient is the regular version. I love the geometric simplicity of the letters, especially the capitals. Montserrat really shines for short pieces of all caps. It reminds me of the elegant simplicity of the old penguin book covers. In lowercase, Montserrat, is still a pretty nice font with a nice large x-height and a lot more character than Arial or Helvetica. 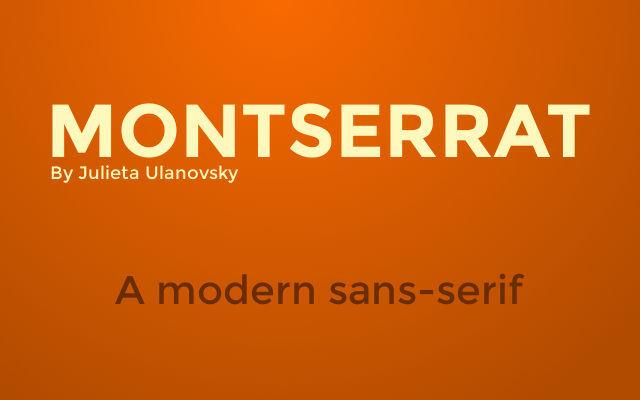 Importantly, Montserrat is released under the SIL Open Font License making it free software in the view of the Free Software Foundation. This is important if you want to do anything useful with the font — learn how it was designed, modify it for your own needs (say by adding new glyphs). Indeed, in font of the month I intend only to review free or open fonts.